Villa Coco de Mer, overlooking one of the most beautiful and dramatic ocean views in the world, is one of the Caribbean's most magnificent private Villas. Designed in a Greco-Roman architectural style, Coco de Mer's palatial qualities are accented with grand Doric columns and an amphitheater that leads to a romantic semicircular 50 ft pool. 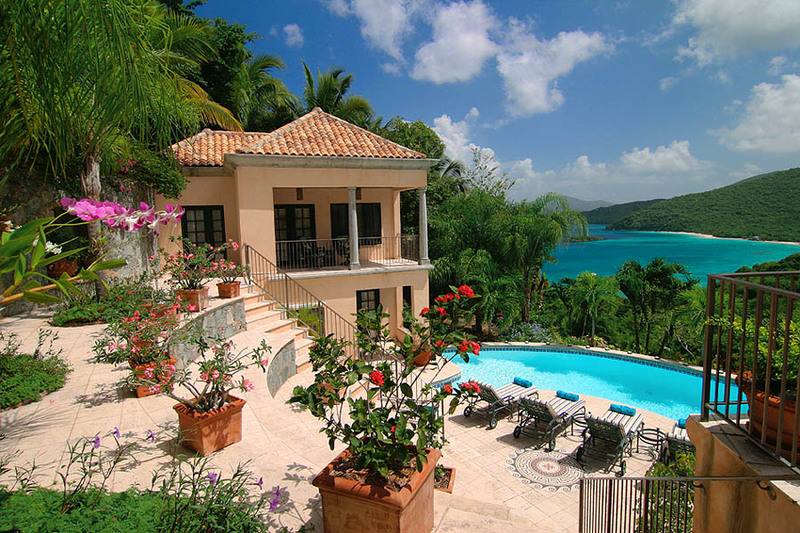 Located at the exclusive gated community of Peter Bay Estate, Coco de Mer is appointed in 5 star elegance and surrounded by the majesty of pristine St. John beaches and tropical panoramas. 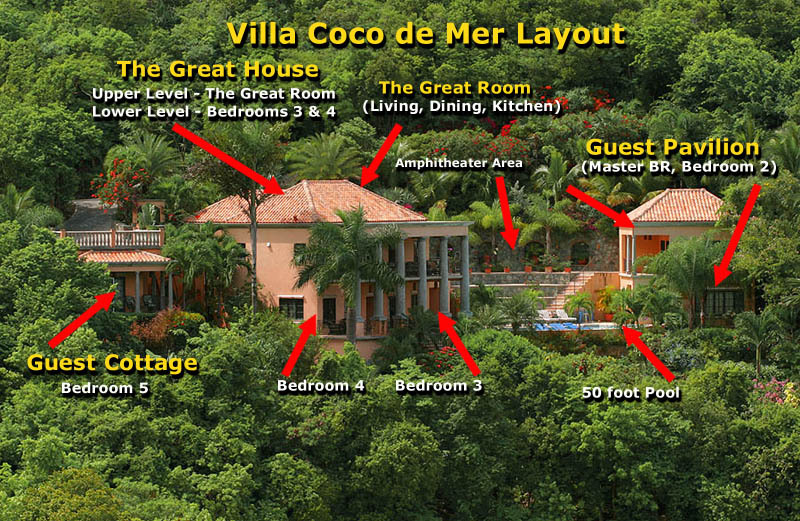 Coco de Mer is secluded, private, and tranquil, yet only minutes away from Cruz Bay restaurants and activities. In the style of a Greek Amphitheater, grand Doric columns, entertainment decks, and tier seating surround a gorgeous 50 foot pool. With Caribbean panoramas of the azure blue bays, white sand beaches, and emerald green hills of the U.S. and British Virgin Islands in the background , the views from Villa Coco de Mer are a breathtaking backdrop of tropical beauty. Pool Yes - 16 x 50 x 3-7ft. NORTH SHORE SETTING. Villa Coco De Mer is located in the upper row of ulta luxury homes that stretch across the exclusive north shore neighborhood of Peter Bay. 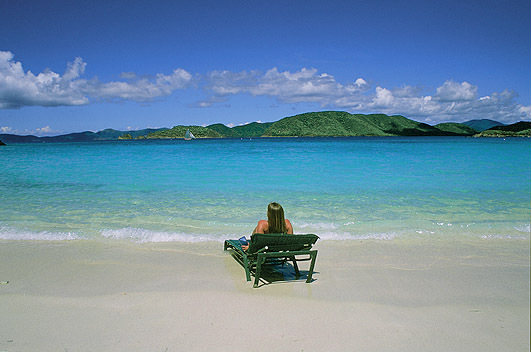 It is about a 5-minute walk from your villa to the white sands and turquoise waters of Peter Bay Beach. Peter Bay is one of the few parcels of pristine north shore land that was not deeded over to the National Park by Lawrence Rockefeller in the 1950s, and today it remains tranquil, peaceful, private and exceptionally scenic, surrounded as it is on all sides by National Park forests, waters and reefs. 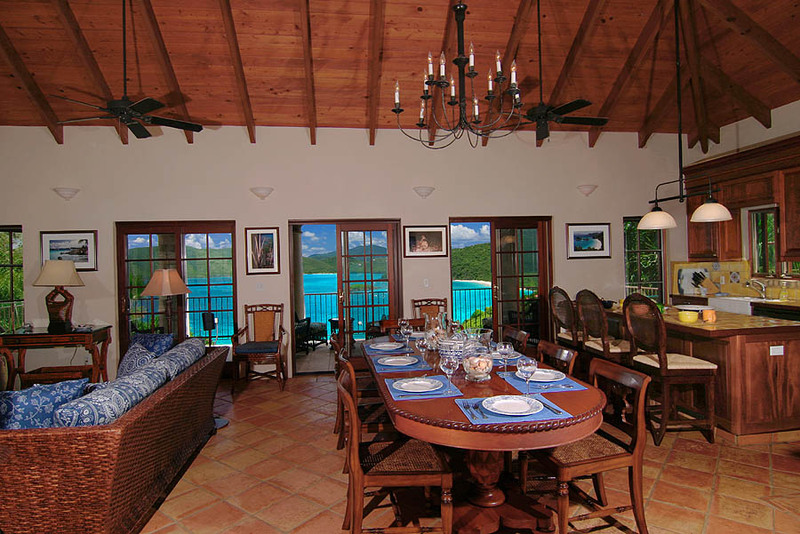 The Peter Bay gated community homes all have deeded access to intimate Peter Bay Beach, which is located between the National Park beaches of Trunk Bay and Cinnamon Bay, and is very similar to these world class, exceptionally beautiful beaches. The fine white sand and usually calm turquoise waters of this exquisite beach provide tranquil swimming and excellent snorkeling. On a perfect beach day in February the National park beaches will host hundreds of people, but it's rare to see even a handful of people on Peter Bay (it's privately owned). 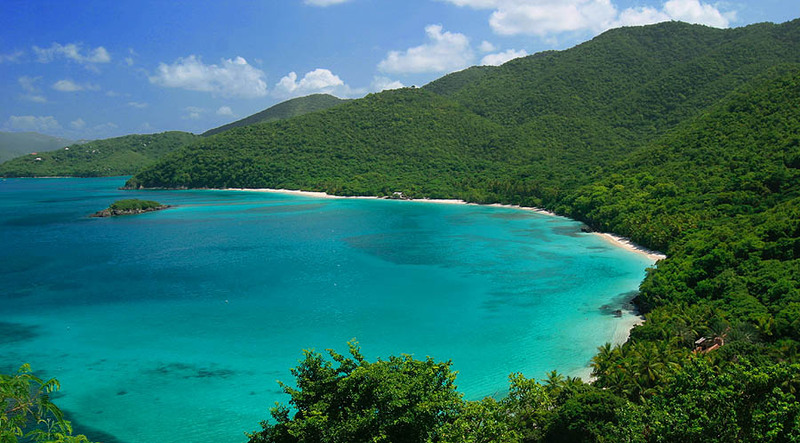 The gorgeous views from Coco De Mer look north and east and include the lush mountains of the north shore of St. John, Cinnamon, Maho and Francis Bays, Whistling Cay, and Great Thatch and Tortola in the British Virgin Islands. It's a 5-10 minute, incredibly picturesque drive to the three restaurants at the acclaimed Caneel Bay Resort, and another 5-10 minute drive to the captivating restaurants, shops and groceries in the fun loving, delightful town of Cruz Bay. The Coco de Mer grounds consist of three structures . The Great House (left), a Guest Pavilion (right) , and a private Guest Cottage to the left of the Great House. The top level of the Great House includes an open living/dining area with a chef's kitchen and breakfast bar. 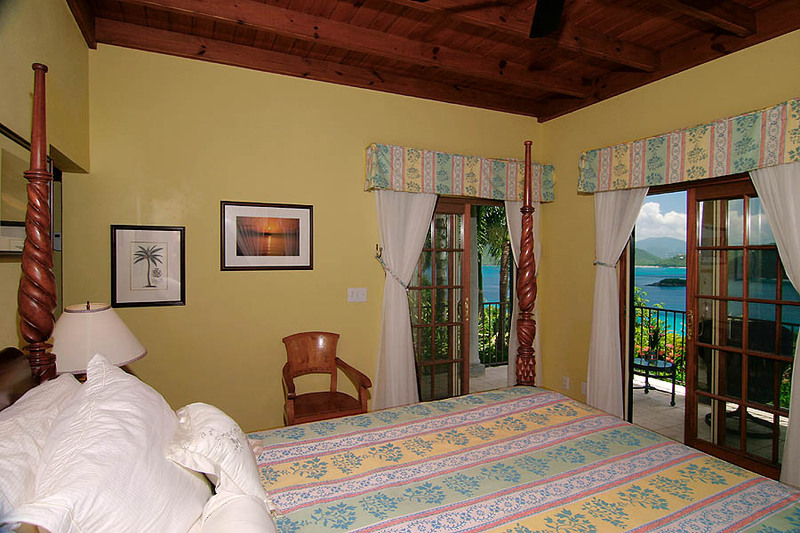 The backdrops to The Great Room are the spectacular bays of Cinnamon and Francis with the views all the way to Tortola, BVI. The lower level of the The Great House, also with beautiful ocean panoramas, are Bedrooms 3 and 4. The Guest Pavilion houses the Master Bedroom (upper level) and Bedroom 2 (lower level). A private detached Guest Cottage to the left of the Great House is Bedroom 5. THE SETTING . Villa Coco De Mer is a spacious (approximately 7000 sq/ft), beautiful estate house that consists of three buildings; a 2-level great house, a 2-level guesthouse to the west of the great house, and a private 1-level guesthouse to the east. You enter from above and descend to a stone courtyard and the upper level of the great house, which contains the kitchen, living and dining rooms plus a powder room. French doors on the upper level open to a spacious covered deck that is framed by Doric columns. Covered stairs lead to 2 bedrooms and a full (6th) bath on the lower (pool) level of the great house. A path leads through a small garden area to the semi-secluded 1-bedroom east guesthouse. Two more bedrooms with superb views are located in the west guesthouse at the edge of the pool. The large 50 foot pool is on the lower level and the 4-person hot tub is just below the pool in a romantic garden setting. A most distinctive architectural feature of this gorgeous home is the terraced area that descends from the upper level to the pool. This is actually a tiled amphitheater with a central mosaic that overlooks the Caribbean and 50 foot pool. *A SONOS® PLAY 5 wireless Hi Fi audio system drives Bose outdoor and indoor speaker, controlled by guests personal mobile devices. The SONOS Play 5 allows access to wide selection of music streaming libraries (Rhapsody, Pandora, Spotify, etc.) and global internet radio stations, in addition to the music libraries of personal smart phones, tablets, and laptops. This beautiful feature makes Coco de Mer a superb home for weddings, family reunions, and corporate events. Click on Sections for Photos. Browser Back Arrow Returns to Layout. Villa Coco de Mer consists of 3 structures on .6 acres overlooking Cinnamon Bay & Francis Bay, allowing privacy and seclusion for up to 5 couples, and plenty of space for weddings and special event functions. The main areas are the the Great House (upper level Great Room, lower level bedroooms), The Guest Pavilion, the Guest Cottage, the amphitheater area, and the 50 foot pool. The Guest Pavilion houses the Master Bedroom, and Bedroom 2. The Guest Pavilion and Great House are connected via the top level walkway of the amphitheater decorated with blooming orchids and desert roses. Two sets of stairs lead to the 50 foot pool, the hot tub, and the lower level bedrooms. Beautiful tropical gardens grace the Coco de Mer grounds.The walking trail to beautiful Peter Bay Beach, exclusive to the Peter Bay community, begins at the gardens below the pool. EXCLUSIVITY. First, begin with the private setting of Peter Bay, which is St. John's finest address for grand, luxury villas. 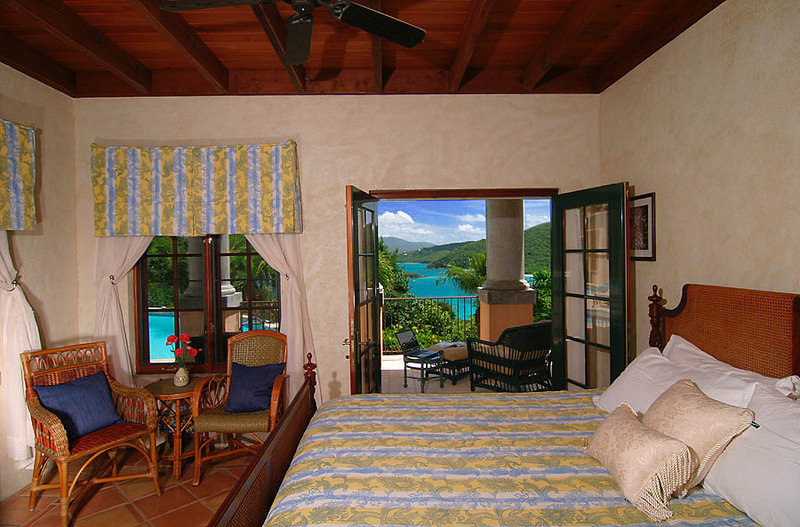 Then, design and build a gorgeous, one of a kind, stately and magnificent villa with truly beautiful, tranquil and unspoiled views of the north shore of St. John - this is Coco De Mer. 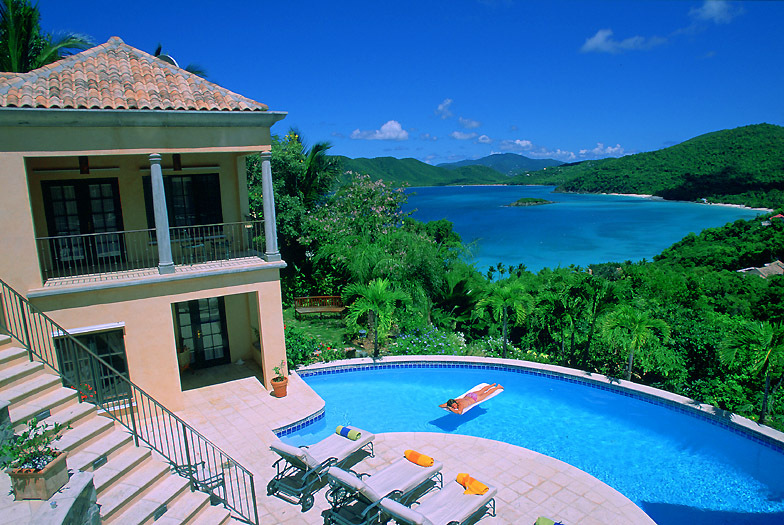 Coco is one of the Peter Bay homes that has redefined the concept of a luxury rental villa on St John. 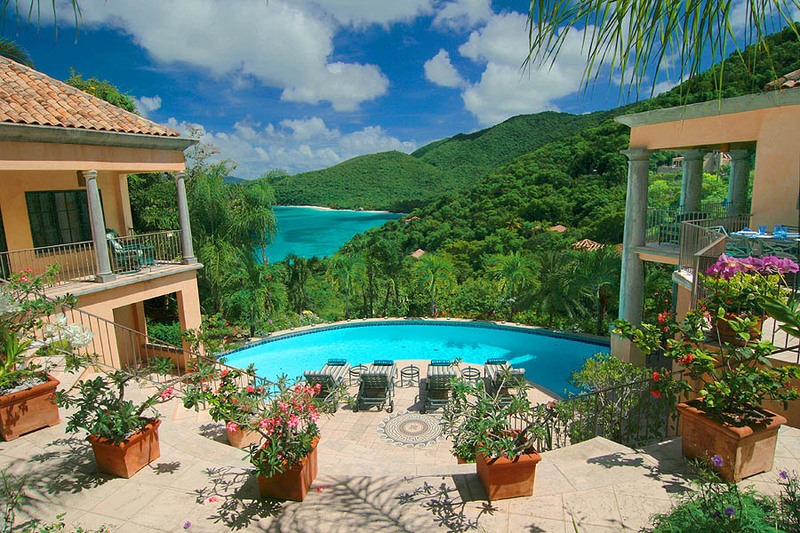 The peaceful, private and exclusive Peter Bay location, and the overall commitment to a luxurious design and excellent fixtures, furnishings and equipment, makes Coco De Mer an exceptional rental villa that is certainly one of St. John's most exclusive. 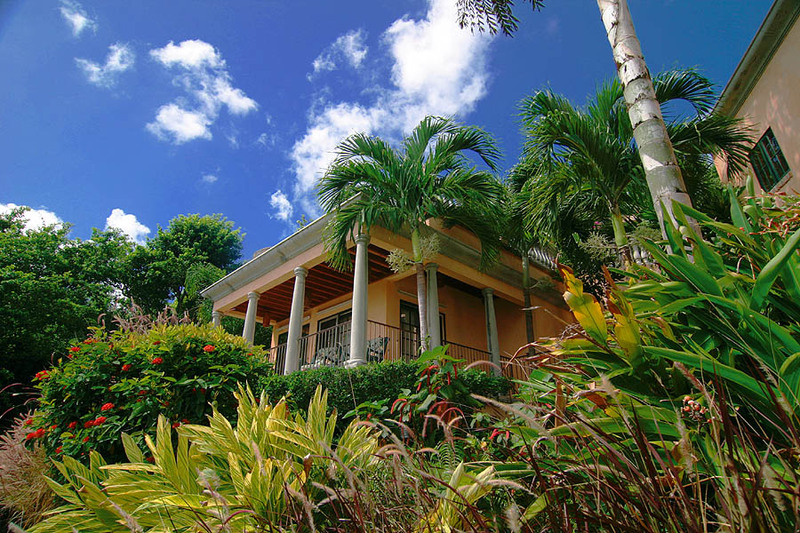 St. John's magnificent North Shore is your front yard at Villa Coco de Mer. 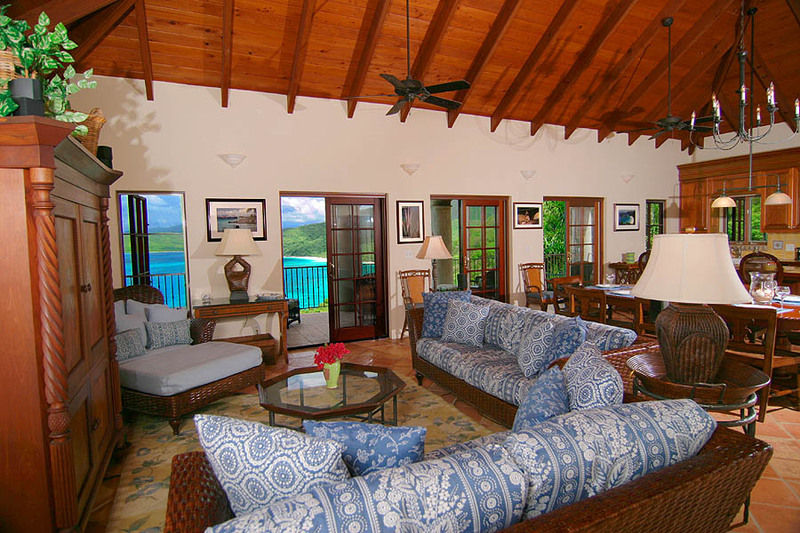 Your view as you sit on the Coco de Mer Great Room Balcony is of great Caribbean landmarks - Cinnamon Bay, Francis Bay, Mary Point, Tortola, and Thatch Island. Peter Bay Estate, the gated community where Villa Coco de Mer is located, is certainly among the most beautiful neighborhoods in the world. It is one of the few parcels of pristine North Shore land that was not deeded to the National Park. At Coco de Mer, you are surrounded on all sides by National Park bays, reefs, and forests - and minutes away from the most beautiful beaches anywhere. Beautiful Peter Bay Beach, about a 5 minute walk from your villa, is exclusive to Peter Bay guests and offers excellent snorkeling and wonderful seclusion. LIVING/DINING/KITCHEN. The living, dining and kitchen areas occupy the entire upper level of the great house. 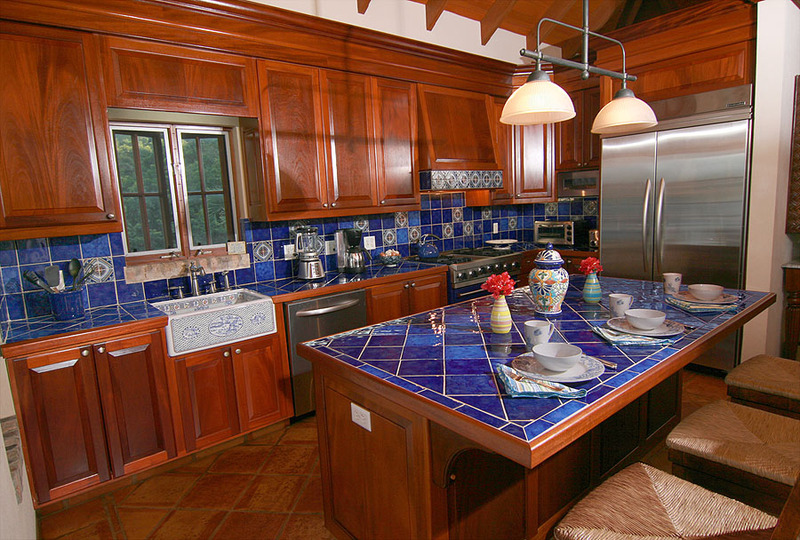 Tiled floors, vaulted beamed ceilings and rich hardwoods define this generous area. French doors open to a sizeable balcony that provides magnificent views and seems like an outdoor extension of the living area. A SONOS® PLAY 5 audio system with HiFi wireless streaming is the centerpiece of the living room entertainment center which also includes satellite TV with surround sound and a video player. The SONOS Play 5 audio system streams wireless from a wide selection of music streaming services (Rhapsody, Pandora, Spotify, etc.) and global internet radio stations. The SONOS audio system is controlled by personal smart phones and tablets, and also plays the music libraries of personal mobile devices. The interior dining table is a handcrafted mahogany table that seats 10 and there is additional exterior dining. The elegant and completely equipped kitchen is filled with rich mahogany cabinetry that is accented by ceramic counter tiles. The kitchen appliances and hardware is all high quality and includes a stainless steel gas grill, refrigerator/freezer with ice maker and dishwasher. A gas barbeque grill, washer/dryer and a fax and answering machine are also included. The splendor of Coco de Mer's Great Room is rivaled only by its magnificent setting. Though it enjoys a state-of-the-art entertainment center with surround sound and wireless DSL, the high definition view from the balcony is the most breathtaking. Furnished for comfort in the tropics, Villa Coco de Mer is appointed with 5 star amenities including elegant dining, a chef's kitchen, a breakfast/lunch bar, and stainless steel appliances. Upon entering the Coco de Mer Great Room, you will realize the essence of a classic great room. Elegant living & dining, appointed with the finest details, and a balcony overlooking the magnificence of nature, truly make the Coco de Mer living/dining area a Great Room. 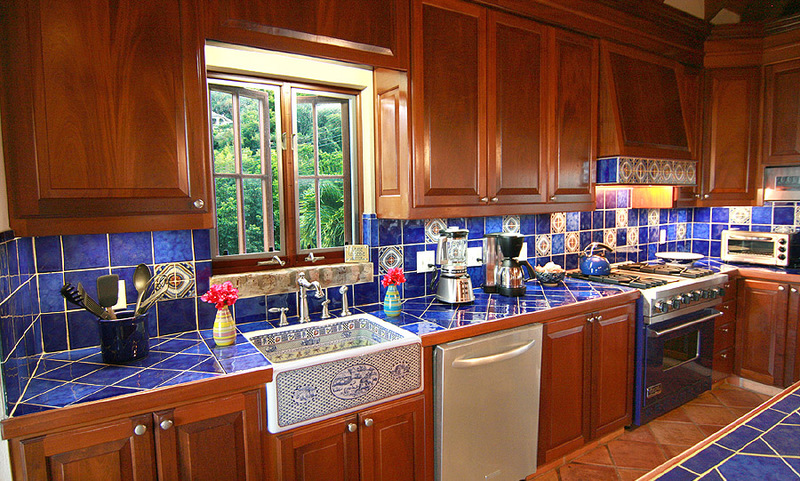 The Coco de Mer kitchen has now been redesigned as shown in the photo below. Coco de Mer's newly redesigned gourmet kitchen features beautiful new additions for 2010 including a hand painted farmhouse sink, Italian Deco tile, Professional Series Viking gas range and stainless steel Kitchen-Aid dishwasher. Designed for serious chefs and culinary aficionados who are connoisseurs of cooking surrounded by the spectacular Caribbean, the newly renovated Coco de Mer kitchen sparkles with its rich mahogany cabinetry, Italian deco tile, and beautiful hand painted sink. 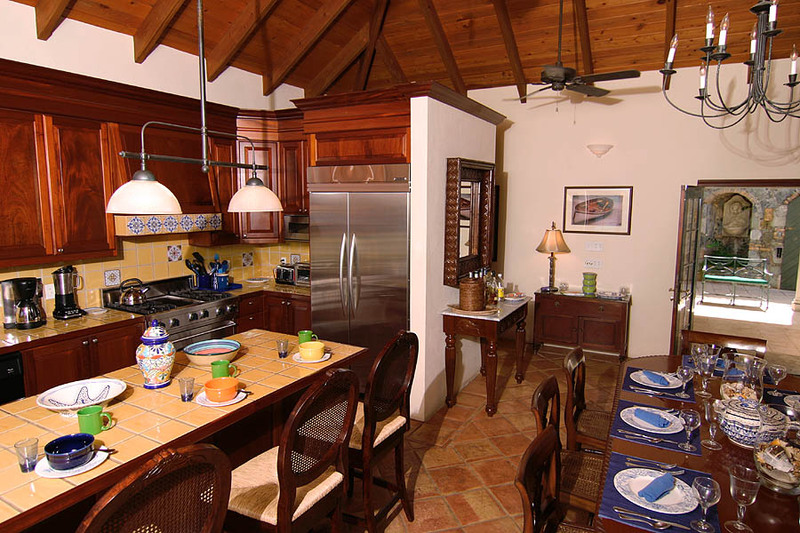 This photo of the previous kitchen design shows the kitchen/dining area in the Villa Coco de Mer Great Room. 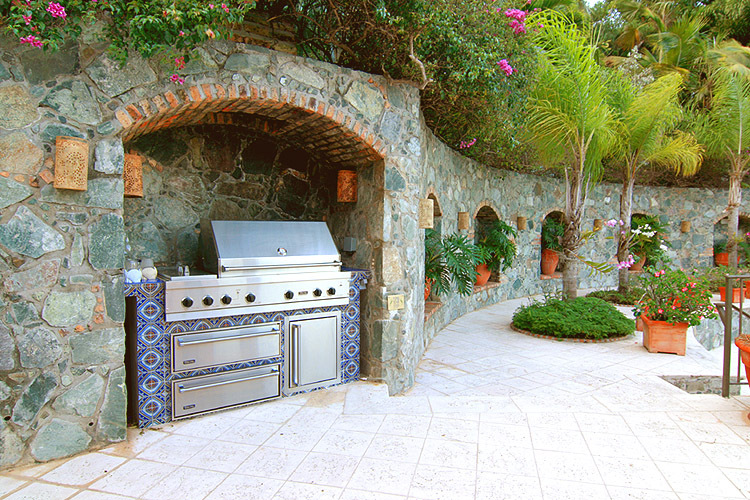 Spectacular outdoor living deserves a state-of-the-art gas grill for your outdoor entertaining. BEDROOMS. All of Coco De Mer's bedrooms have king beds and are air conditioned (one of the lower great house bedrooms has a set of twin beds that convert to a king), and all have French doors that open to views, decks or balconies. The bedrooms are all of approximate equal size and quality, although the west guesthouse bedrooms have the preferred balconies and views. All bedrooms have a satellite TV/VCR and a tiled bath and shower and all are attractively furnished and accessorized. 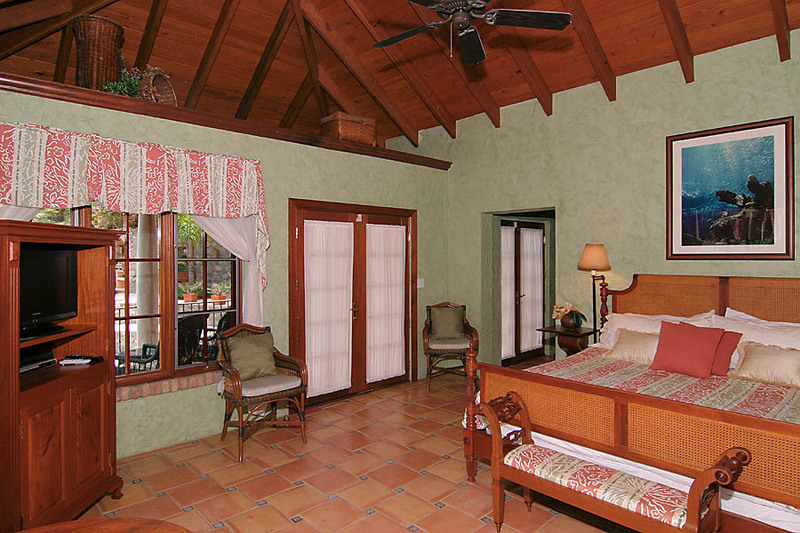 The Coco de Mer Master Bedroom is located on the upper level of the Guest Pavilion. Bedroom 2 is located on the lower level of the Guest Pavilion, adjacent to the 50 foot pool overlooking the North Shore. Bedroom 3, on the lower level of The Great House, opens to stately Doric columns and yet another spectacular view of the North Shore. An expansive balcony offers plenty of shade, and the tranquility and peacefulness of such beauty are a wonderful incentive for idleness or business. Bedroom 4, with two twin beds that may be prepared as a King, is on the lower level of The Great House. 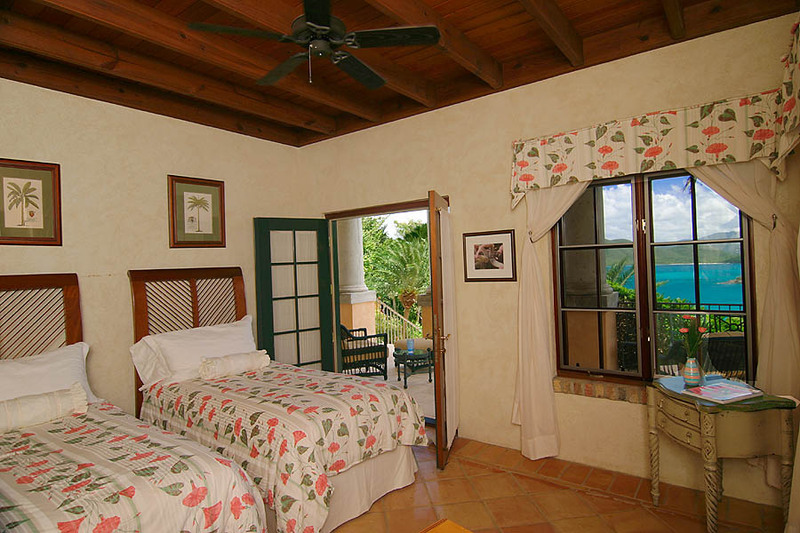 It is adjacent to Bedroom 3 and also opens to awesome Doric columns, cool breezes, and wonderful tranquility. For those who desire even more privacy, Bedroom 5 at Villa Coco de Mer is a private cottage (The Guest Cottage) adjacent to the Great Room. 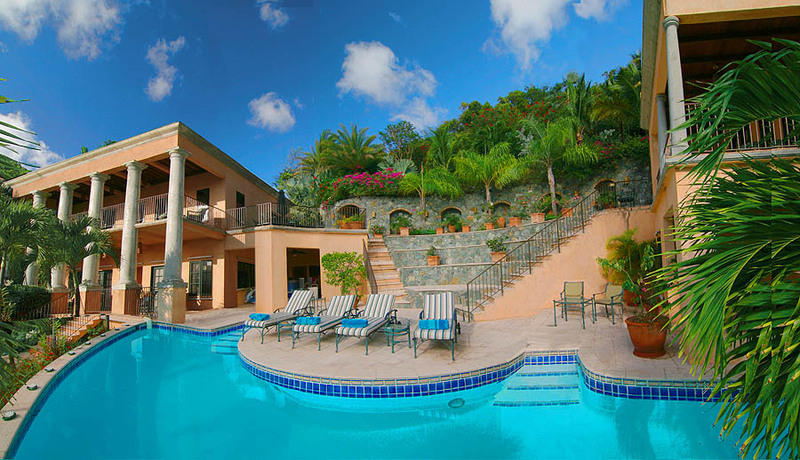 Enjoy beautiful Caribbean views from your private balcony apart from the Great House - yet only seconds away from the pool, hot tub, and the Great House. 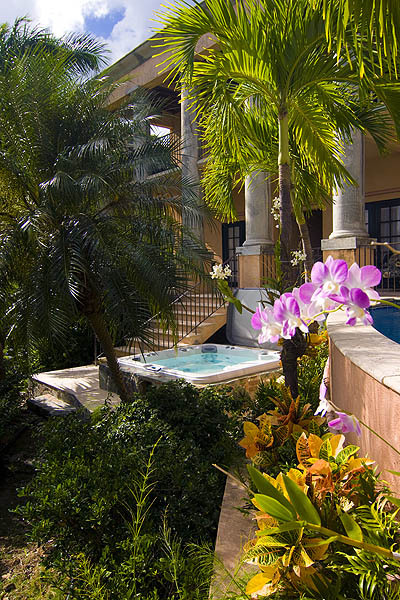 This lovely romantic cottage is surrounded by gardens of tropical plants and flowers. 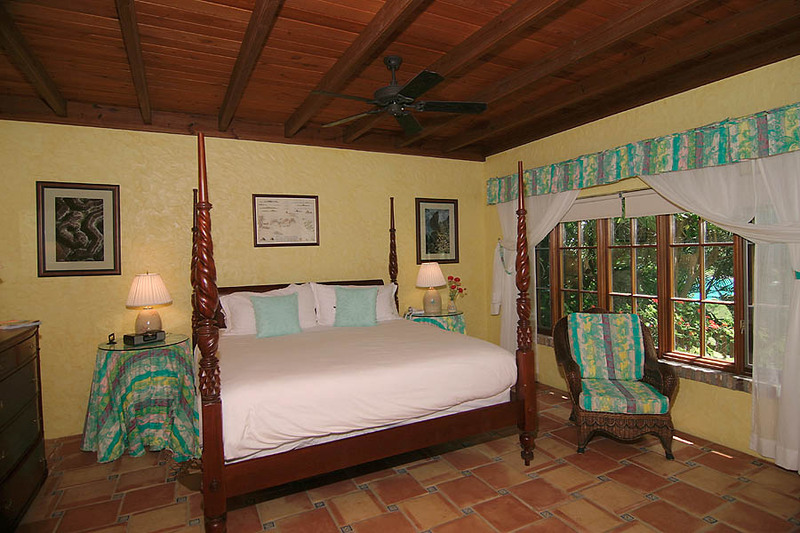 The romantic Guest Cottage (Bedroom 5) adjacent to the Great Room and surrounded by magnificent tropical gardens. COCO DE MER SUMMARY. Coco de Mer has a dual personality that gives it a popular appeal. For those who need to relax in the sun and do nothing, the sunny, open decks, outdoor speakers, oversized pool and peaceful setting make for luxurious relaxation within a magnificent setting of tropical natural beauty. 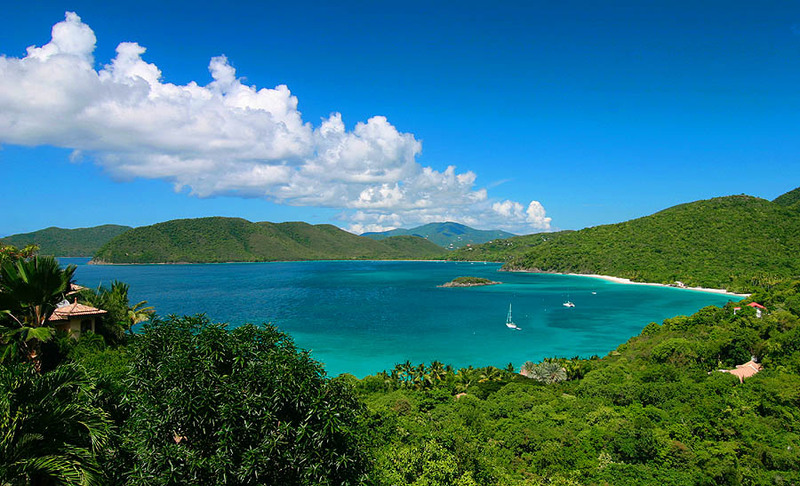 For the active lifestyle, St. John's world-class beaches and hiking trails, and water sports activities - including scuba diving, kayaking, sailing, motor yachting, deep sea fishing, and USVI & BVI island excursions - offer all the adventure that hours in a day will allow. This is truly a magnet villa. It is so accommodating, luxurious and enjoyable that you have little reason or desire to leave the house - it holds you in place like a magnet. But St. John, with its hiking trails, reefs, beaches, boating and exploring, and the delightful shops, restaurants, people and atmosphere of Cruz Bay, give you plenty of reasons to leave your villa. This gorgeous home was designed to accommodate guests in near equal luxury and comfort. Coco de Mer is a 5 bedroom home that gives 5 couples plenty of privacy and space, while also providing elegant and relaxing common areas for everyone to be together. With the amphitheater overlooking the pool and the gorgeous north shore views, this is also a home that is designed for, and highly recommended for functions such as weddings or parties. Coco De Mer is beautifully and abundantly landscaped and the tropical landscaping and the upper tier location give Coco a sense of privacy and seclusion, yet the delights of Cruz Bay are only a 10-15 minute drive and the restaurants at the renown Caneel Bay Resort are an even closer, 5-10 minute drive - of course, depending on how often you stop to gaze at the truly spectacular and dramatic views. Coco de Mer is a 5 star villa highly recommended for families, couples, groups, business meetings and events, and weddings. *Christmas / NY Rates (12/17/16 to 01/04/17) - Add a factor of 1.4 to above rates. *President's Day, Easter, & Thanksgiving Weeks - Add a factor of 1.2 to above rates. *Add 12.5% hotel tax and a 5% service fee to above rates. *Holiday rates are priced at the 9/10 person rate. "Surrounded by the Majesty of the VI National Park"